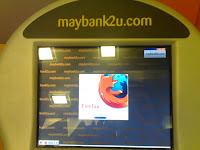 Maybank is using Mozilla Firefox for Maybank2u.com Internet Kiosk. I found this Last Thurday, , during my visit to Berjaya Time Square Convention Center, Kuala Lumpur, Malaysia, for MSC Malaysia OSCONF 2009 site visit. 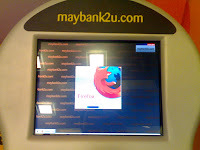 When you click a button display on the Maybank2u.com Internet Kiosk, It will launch the Mozilla Firefox and I attached in my blog the capture screens. 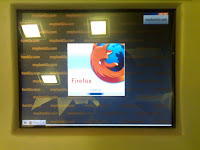 Gen Kanai from Mozilla will love this.